Many women with polycystic ovary syndrome find that their busy schedules make it difficult to eat healthfully. 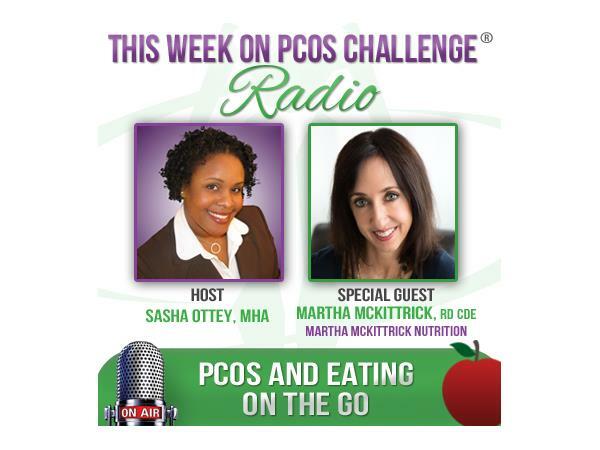 With nutrition being an essential part of PCOS management, registered dietitian and certified diabetes educator, Martha McKittrick, R.D., C.D.E joins Sasha Ottey on the PCOS Challenge radio show to give tips for healthy eating on the go. Martha McKittrick is a registered dietitian, certified dietitian-nutritionist and certified diabetes educator in New York City. She specializes in weight control, cardiovascular health, diabetes, sports nutrition, PCOS, GI issues including IBS, women’s health and preventive nutrition. She has worked at a major New York City Hospital for over 20 years as well as in private practice. Martha has appeared on numerous television, radio and webcast programs. She has written for publications and serves as a nutrition expert on sites including EveryDayHealth, About.com, and CafeMom. Martha also lectures on a regular and has been a spokesperson for several major companies. She also served as the nutritionist for a New York City Marathon. Join other women and girls with polycystic ovary syndrome at PCOSChallenge.com.